Wooster’s Condemned: 665 N. Bever St.
You are here: Home / History Bytes / Wooster’s Condemned: 665 N. Bever St.
At the southeast corner of N. Bever and Spring Streets, sits a gargantuan wood frame building. It is so big it is hard to capture the whole thing in one picture. Currently painted a color that has faded to somewhere between institutional and puke green, it sticks out in the neighborhood like an elephant at a mouse convention. The house at 665 N. Bever St. viewed from Spring St. on the north side shows the huge size of the building. Photo by author. It’s been called many names over the years and lately most are of a derogatory nature. Architecturally, it offers nothing of value. It’s not really a creepy house but if you’re the sort inclined to believe inanimate objects like an old house can project an energy or possess a presence of its own, you get the feeling that this old building is sad. A down-on-your-luck, never lived up to it’s potential or intended use, sort of place. That it has had a lifetime of hard knocks and has been preserved by simple neglect. 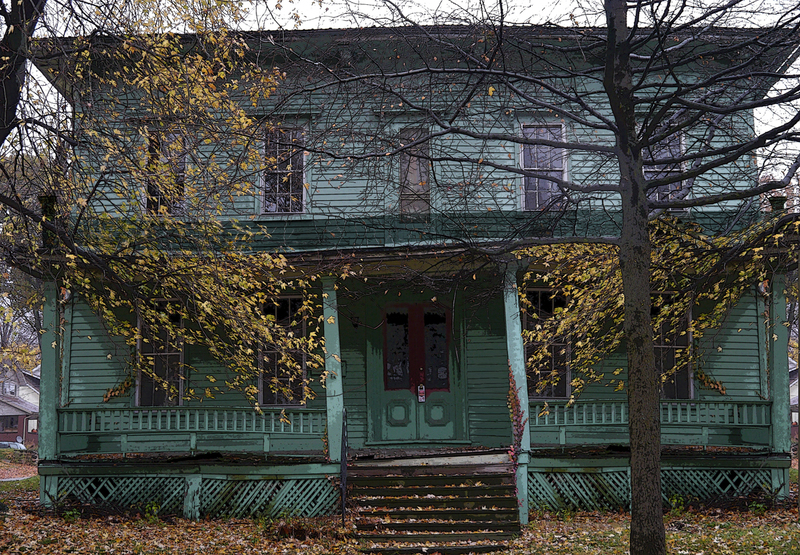 Fortunately, this old house will be put out of it’s misery soon: it has been condemned by the City of Wooster and is scheduled to be demolished within the next three months. As it breathes it’s last painful few breaths on the Wooster landscape, we should take a few moments to reflect on it’s history. It’s an old house. A really old house. A 143-year-old house. The building was erected during the Summer of 1869 by Dr. Joseph M. Irwin, a 66-year-old retiring physician from Mansfield, Ohio, who came to Wooster to start a new business with his wife and daughter. He wanted to open a boarding house to shelter all the incoming college students whom he was convinced would be flooding the Wooster landscape when the new school opened in the Fall of 1870. By January 1869, the University’s impressively large brick building, Old Main, had the central five-story tower up, the slate roof on, and all the windows installed. Looking at this building, Dr. Irwin must have been convinced this school was going to attract hundreds of students and knew they would need a place to stay while in school. A place they would be willing to pay a premium price to be close to the campus’s main building. 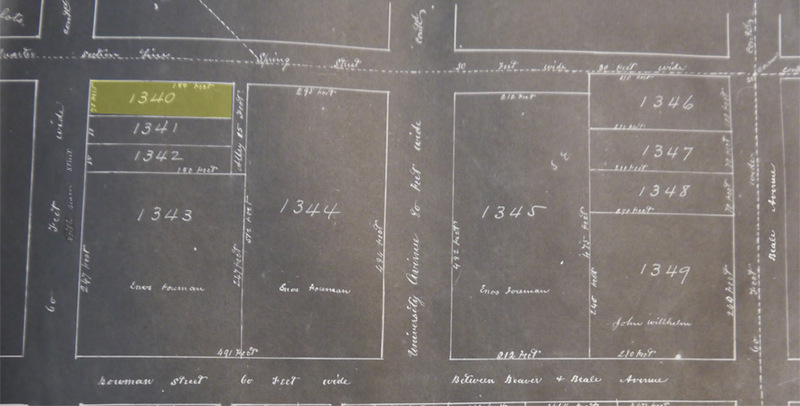 Early Wooster plat map showing the location of Lot #160 that was renumbered to #1340 in 1870. There were no other houses in the neighborhood when 665 N. Bever St. was built it was all pastures and woods. Click image to see larger version. Dr. Irwin found what he thought was the perfect spot for his new boarding house on the southeast corner of N. Bever and Spring Streets and negotiated with the land owners, Enos and Lucretia Foreman, to buy a lot there. He bought Lot #160 for $1,200 (in the 1870 renumbering of Wooster, it became Lot #1340 which it still is to this day). The new Boarding House being erected by Dr. Erwin (Irwin), of Mansfield, on the corner of Beaver and Spring streets in Wooster, is now under roof. Joseph Caldwell has the contract for completing the building ready for occupancy, and is pushing on the work with energy. The house is large and will accommodate from 40 to 50 boarders comfortably. As soon as completed Dr. Erwin (Irwin) will occupy it with his family. In her book, Wooster of the Middle West, Volume 1, Lucy Notestein noted that Dr. Irwin saw his boarding house as an investment opportunity and said that it offered one of the finest views of landscape scenery to be had anywhere in the State. This photoshopped version of the front of the house at 665 N. Bever St. depicts what it might have looked liked when built in 1869 and before the addition was added to the front of the building. Photo and artwork by author. There is no record that Dr. Joseph Irwin and his family attended the opening day ceremonies of the University of Wooster in 1870, but it is likely. The place was reported to be swamped with a mass of people from all points of the city, county, and state. Irwin must have been salivating at the prospect of filling his boarding house to capacity. Unfortunately, the actual number of people out of the large crowd who signed-up as students that first day was only 34. Over the course of the year, another 27 enrolled and the total student population for 1870 was tallied at a mere 61. What Dr. Irwin had not anticipated was competition. Competition from local townspeople who cheerfully opened their homes and took in University students or offered cheap rooms for rent. 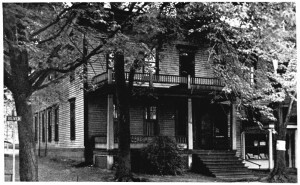 Of the 61 University of Wooster students in 1870, only seven opted to board at Dr. Irwin’s Boarding House: William A. Ervin, Andrew E. Creighton, Perley M. Cartmill, James Connell, Joseph R. Miller, Horace L. Smith and James Brady. These students formed an “Eating Club” and dubbed themselves the “Bone Pickers” as food was scarce and hungry young men would not let anything go to waste. In those days, there was no cafeteria or meals provided on campus as part of your tuition. Students had to pool their money, buy their own groceries, and hire a woman to cook for them. It is likely that this same group of students gave the big house it’s very first nickname: the “Barracks”. — Dr. Irvin’s (Irwin) boarding house came very near being destroyed by fire last Tuesday evening. Two straw ticks had been laid away in the attic, and by some means the straw in these took fire. A timely discovery saved the building. Some damage was done to the plastering by water, and all told will not exceed $100. After the suspicious fire, the true nature of Dr. Irwin’s financial troubles came to light during the November court session. It seems contractor Joseph Caldwell had procured all the lumber used in construction of the boarding house from Curry Lumber. James Curry, John Curry, David Curry and Wellington Curry, partners under the firm name D.C. Curry & Co., took Joseph M. Irwin to court to obtain judgement against him to recover the $525.04 he owed them. They won, and Irwin was ordered to make the payment by February 20, 1871. When Dr. Irwin could not make the payment, the Wayne County Sheriff, George Steele, ordered that the property be sold at public auction on March 25, 1871 to pay off the debt. The real estate investment partnership of Captain G.P. Emerich and partner Curtis V. Hard bought the property for $4,000 at public auction. In 1872, Emerich, Hard, and their wives decided to dissolve their partnership and William T. Culbertson and his wife partnered with Curtis Hard on the house for $5,000. By 1873, William T. Culbertson and his wife, Sara, owned and ran the boarding house and the “Culbertson Eating Club” was known for providing good meals to students. However, by 1875, the Culbertson’s no longer wanted the white elephant on the hill and sold it to the real estate company, Emrich, Barrett & Co., made up of Captain G.P. Emerich, Bethel Barret, Perry Miller and Jacob Derr, for $5,750. After nine years, the big boarding house again hit the skids. Emerich and company had over extended themselves and owed the Creston banker, W.P. Stebbins & Sons, $1,782. 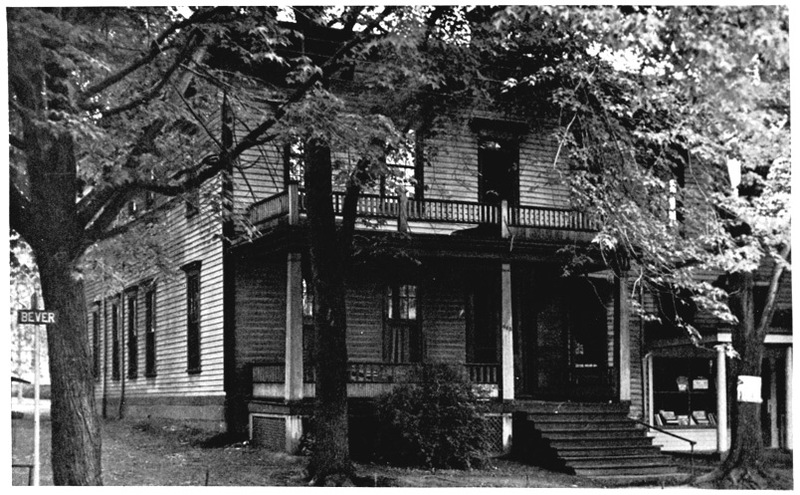 To settle the account, the house was again sold by the Wayne County Sheriff at public auction on September 15, 1884. The deed records show the highest bid was $2,778 from Mr. A.E. 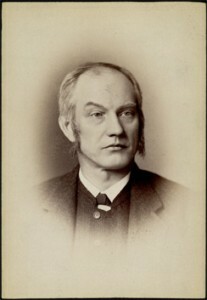 Taylor, whose full name was Archibold Alexander Edward Taylor, better known as President A.A.E. Taylor of the University of Wooster. 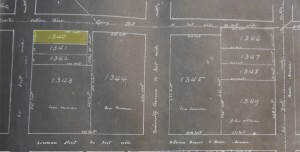 Mr. Taylor being an astute businessman, or taking advantage of the situation, turned around and sold the property to the University of Wooster on November 18, 1884 for $5,000. Inside of Karl Merz’s Music Hall at 665 N. Bever St. Image courtesy of Special Collections, The College of Wooster Libraries. After the property became part of the University of Wooster, it entered what might be called it’s glory days: it became a useful building and came to life within the Wooster community. It became a destination place for townspeople on most Saturday afternoons. The college turned the boarding house into it’s new Conservatory of Music and eventually came to be known by it’s next nickname: the Old Music Hall. 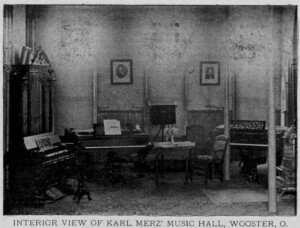 The College of Wooster’s first music director, Karl Merz. Photo by Teeple and image courtesy of Special Collections, The College of Wooster Libraries. They installed their first Director of Music, professor Karl Merz, in the house. Dr. Merz and his family gave the old boarding house a new vitality and purpose. Merz and his family lived on the upper floors and gave lectures and music lessons on the lower floors. Alvin Rich reported in his August 4, 1949, Daily Record news article about the house that at some time during Professor Merz’s association with the college, he made some changes in the building to provide better living quarters for himself and to create a small hall or assembly room for concerts and lectures. This room was reported to have the capacity for about 300 people and was the only “bright spot” in the building’s history. In this assembly room, there were free lectures and concerts every Saturday afternoon which were always well attended. 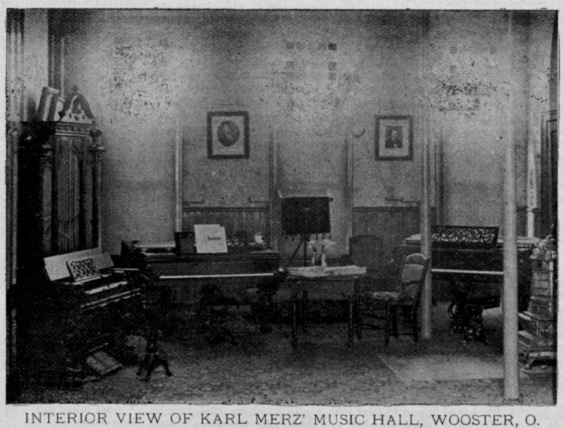 By 1889, Karl Merz had so successfully grown the music department that he needed to hire extra assistants to help teach all the students he had attracted, and the house became cramped for space. According to Notestein’s book, during the Summer of 1889, practice rooms were added onto the house. Which explains the original purpose of the large addition that extends eastward on the back of the house. However, Professor Merz did not get to enjoy the extra space for very long. At the beginning of January 1890, Karl Merz developed a heavy cold but continued to teach as long as he was able to go downstairs and meet with his classes. As the month wore on, the cold grew worse. It developed into pneumonia and he became bed-ridden two days before his death. On January 30, 1890 at 4:30 p.m., Karl Merz died in his bed on the upper floor of the big house. After his death, the body lay in state in his beloved assembly hall on the lower level and for two hours a steady stream of people came to the house to express their condolences. The storefront addition to the front of the house was added between 1912-1914 by David Thomas and Glenn Raymond who operated the Thomas & Raymond grocery at this location until about 1920. The University continued to operate the Music department out of this building until 1912 when it no longer met the needs of the college, and it was sold to David J. Thomas and Glen H. Raymond and their wives for $5,000. The two families being related, as David Thomas’s daughter, Florence, married Glenn Hyde Raymond in 1903 and both families were well known in the Akron, Ohio area. David Thomas and Glen Raymond were both grocers working for other firms in 1912, but after purchasing the big house on N. Bever Street in Wooster, they decided to go into business for themselves. Sometime between 1912 and 1914 they built the storefront addition onto the southern front side of the building and by 1915 the “Thomas & Raymond Grocery” was running at this location. Then in 1920, David Thomas, Glen Raymond, and their wives sold the property to Zenas W. Zimmerman and his wife for about $7,272. They immediately turned around and sold the property a day later to Meyer Shapiro, who ran the Wooster Iron & Metal Co., for $8,000. Meyer Shapiro never lived in the house and only owned it as an investment property in which he collected rent for rooms and the grocery store business. Kirk & Dalby Grocery, 1919-1922, a partnership between Spring St. residents Earl W. Dalby and Dwight H. Kirk. Dalby Grocery, 1923-1927, Earl Dalby ran the business by himself. Lerch & Conrad, 1928-1932, a partnership between John W. Lerch, a Sterling resident at the time, and Harvey W. Conrad, living on College Ave. in Wooster. Conrad’s Food Store,, 1933-early 1940s when John Lerch left the business in 1932 to start Lerch Pastry Co. which developed the locally famous Lerch’s Donuts, Harvey Conrad continued to run the grocery store himself. However, it was no longer in business by the time the 1946 Wooster City Directory was printed. Doty Upholstery Co., 1949, the last business to operate out of the old grocery store addition was run by Donald L. Doty, but he was out of business by the time the 1952 Wooster City Directory was printed. Meyer Shapiro held onto the property until 1946 when he transferred ownership to Samuel Shapiro, Ida Guttman, and Rosabelle Caplan for one dollar. They held onto the property for ten years and Alvin Rich in his 1949 Daily Record article, noted that it sat empty for a number of years between 1946 and 1951, but had started renting “apartments” by 1952. The front of 665 N. Bever St. circa 1940s notice the big glass window in the store-front on the right. Click image to see larger size. Image courtesy of Special Collections, The College of Wooster Libraries. In 1956, Samuel Shapiro, Ida Guttman, and Rosabelle Caplan sold the property to Thomas R. Long and Beryl M. Long for about $10,000, according to the $11 conveyance fee stamps on the deed. They continued to rent apartments in the three different sections of the building: main house, back addition, and storefront addition. The Long’s sold the big house in 1969 to Paul H. Snyder and Paul Haston and their wives for an estimated $29,500, whom also utilized it as a rental property. In 1972, Paul Snyder and his wife sold the property to John R. Sanderson and his wife Reba for roughly $25,500 and they too operated it as a rental property. Reba Sanderson sold the house for $60,000 to Jeffrey and Kathleen Slusser in 1987 and they have owned the property ever since that time renting apartments. The neglect of building maintenance during the Slusser ownership has contributed to the latest round of nicknames for the building, none of which can be repeated in polite company. 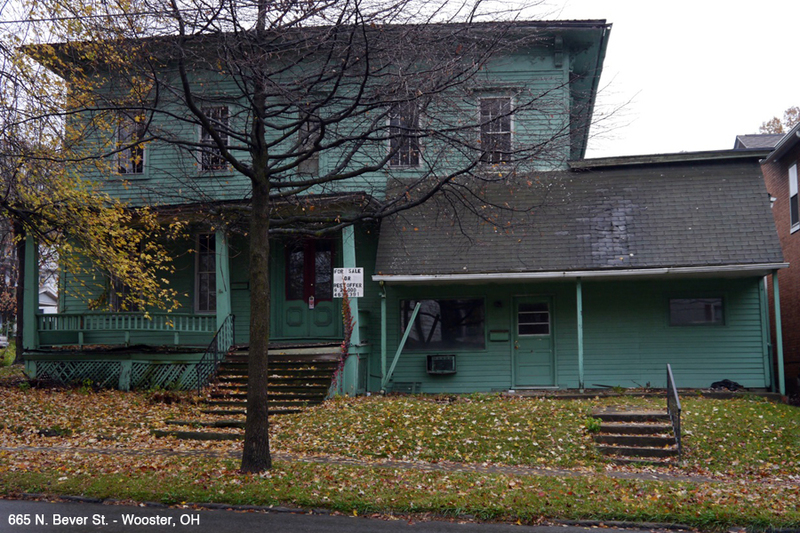 By 2012, the 143-year-old house at 665 N. Bever Street has deteriorated to the point that according to the Wooster City Building Inspector, Tim Monea, the house is unfit for human habitation due to unsanitary conditions, dilapidation, and questionable structural integrity. It has so many problems that it is unreasonable to even try to repair the structure. 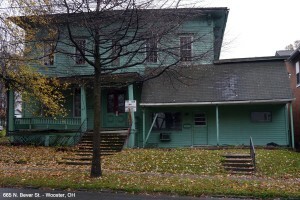 Therefore, the house has been condemned by the City and will be demolished with the Slusser’s consent, using money from the Moving Ohio Forward Demolition Grant Program. These Grant funds come from a state and federal settlement with the nation’s five largest mortgage services — Bank of America Corporation, JPMorgan Chase & Co., Wells Fargo & Company, Citigroup, Inc., and Ally Financial, Inc. (formerly GMAC) — over foreclosure abuses and fraud, and unacceptable mortgage practices. The money was distributed to each of the counties in the state based on foreclosure figures and Wayne County was awarded $426,204 for demolition purposes. How much of that money will be used in demolishing 665 N. Bever St. is unknown at this time. 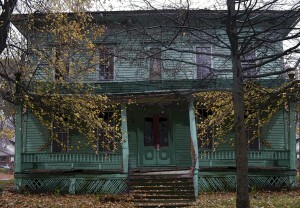 After 143 years, this old house will be bulldozed into oblivion and become nothing but history and urban legend. When the death-bell strikes, listen carefully and you might imagine to hear the opening bars from Handel’s Messiah aria, I Know That My Redeemer Liveth. A favorite of Dr. Merz that was played every year he lived there and a fitting tribute to the old house at 665 N. Bever Street. This should be a Historic landmark and restored! $426,000, hell I’d do it for 1/2 of that…not only is it a historical landmark but also goes to show the rip off of the tax payer. The old house has been demolished and a new Habitat for Humanity house was built on part of the property. The $426,000 was awarded from the State to demolish abandoned or derelict houses ALL over Wayne County not just this one house in Wooster.